Learning is uncomfortable… it has to be! If you’re comfortable, you can already do it… learning means doing something you haven’t done (yet). Doing something new, or doing something differently, feels uncomfortable. Most people go to extremes to avoid discomfort. They will avoid change and avoid learning because it’s easier to keep doing the same “nearly okay” than to put in the effort to change the situation. Holding the status quo feels easier than growing. According to psychological evolution theories, human brains are built for survival. Stability and predictability that reinforce the status quo is instinctively preferable to change. Humans are hardwired for social bonding. We don’t want to show we’re awkward or bad at something to avoid embarrassing ourselves. Humans developed societies that provides rapid results and instant success. We want it, and we want it now… which doesn’t happen during learning. Instead, it feels like a struggle without immediate reward. So, you’re programmed to resist change, and society has taught you to expect immediate results. But learning anything, including songwriting, is a journey. Exploring and struggle are part of the process. Why fix it when it’s not totally broken? For example, it feels easier to play through songs you already know, instead learning new songs. It’s easier to repeat the same mistakes than to settle down to some deep practice on a problem phrase. It takes 10 minutes to create a file for your business receipts, and put your receipts there whenever you get them. This will save hours of frustration at tax time. I make a distinction between anxious and anxiety. I’ve played countless gigs, about three hours before a show I’d start getting jittery, too much energy and didn’t know how to channel it. I realized it wasn’t nervous about the show, but “I want to play now”… I was excited and didn’t want to wait for the adrenaline rush to start. Anxious is uncomfortable because it’s difficult or scary… you can learn to channel it into a performance or any situation that’s got you nervous. Instead of avoiding the “anxious situation” learn to confront and deal with it. Anxiety is anxious that you can’t control… for some it’s debilitating. You can’t think or act… all you want to do is retreat. Anxiety is beyond uncomfortable, it feels insurmountable. With true anxiety consult a physician or other health care professionals. Learning happens outside your comfort zone. Lev Vygotsky (REF) first proposed the theory of Zones of Proximal Development in the 1920s. In brief, the best learning happens just outside of your comfort zone. You can most easily learn new skills or knowledge that is slightly harder than what you can already do. What I can already do comfortably… It’s I can do it, it’s easy! What I can almost do… Almost there! What I can figure out on your own… If I sit down with this, I’ll have it figured out! What I can do with help from somebody else… If someone showed me how to do it. What I can’t do… It’s just not going to happen. I might not want to put the time in to learn it or I have other higher priorities. I can run 30 meters comfortably. I can run 100 meters but I’m winded. I can figure out how to slow down and run 100 meters without feeling like I might throw up. I can get someone to teach me the 10 minute run, 1 minute walk technique and if I slow down a bit, I can run a kilometer. If I join a running clinic or find a running coach, I can learn to run a 10 kilometer race. I’m not going to run a marathon, because I’d rather practice writing songs than spend that much time training. I can write a chorus. I can figure out how to use different rhyme schemes but transcribing songs that I like. I can watch YouTube videos that explain how to write verses. I’m not going to write and arrange the symphonic parts to my greatest song, because I don’t want to hire an entire orchestra and pay for the studio time and snacks for everyone. I can play and sing cover songs and originals. Scaffolding is a fancy word in educational theory for creating intermediate steps towards a learning goal. A scaffold is a temporary structure around a construction project. In learning, it’s setting up intermediate learning goals… deciding what smaller things you need to learn a big thing. Creating stepping stones between goals helps you accomplish your learning goals. Focus Your Songwriting Super Powers outlines how to break a song into manageable pieces, instead of writing an entire song in one setting. Create Your Songwriting Practice Routine explains a detailed approach for developing your songwriting skills. What do I do about being uncomfortable? You need to practice being uncomfortable so you can become comfortable there. Don’t push yourself too hard or too fast. What you can do comfortably can become boring. It’s easy instead of a challenge. Learning is maximized when you are working on what you can almost do on your own. You need a “just right” challenge, so get a little uncomfortable! How Much Is Too Uncomfortable? Learn from someone who can already do it. Relax your expectations and give yourself more time to learn it! Writing a song is a complex process, with many interrelated decisions where you balance musical details to create an awesome song… simple in theory but complicated in reality! Decision making takes energy… it’s easier to zone out in front of a screen than to make creative decisions, especially after a busy day of work. For help creating regular songwriting habits, get Daily Songwriting! 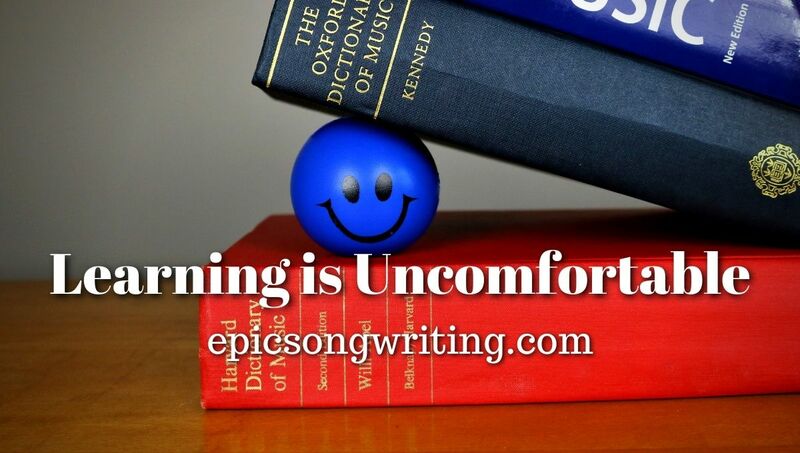 If you’re new to songwriting, it’s new… of course it can be uncomfortable. Figuring it out on your own can be a struggle, that’s why I created the Ultimate Songwriting Jumpstart. Coming up with “new” ideas for a song, or a personal interpretation of a universal theme can be difficult. Brainstorming is my go-to songwriting technique for coming up with song and lyric ideas. It’s frustrating and uncomfortable when you expectations are higher than you abilities. Songwriting is a journey, any song is a reflection of who you are as a person and a songwriter at the time. Your songs improve as you learn. Songwriter Ian Sherwood and I discuss this topic in Songwriting Sprint. Pushing your limits, stretching your abilities with each new song is a healthy sort of uncomfortable… keep growing! Save time by spending money. Don’t waste time complaining about poverty… nobody wants to hear how broke you are. Instead, make a plan and do something about it… save for big purchases by regularly putting some money aside. I think of my day job as the way to finance my passion for songwriting! And gained experience performing and made money playing hundreds of gigs as a leader and sideman…. If it’s uncomfortable because it’s hard, find a way to make it easier. Pick a big goal… what do you want to do? What do you need help to do? What can’t you do yet? Who can you get help from? Where can you spend money to make it easier? How much money can you start saving? Now put a plan together and pick a deadline that motivates you! What do you want to accomplish and what help do you need? 0 responses on "Learning Is Uncomfortable"